In this article I look at air pollution levels within Europe and among the G-20, discuss some of the recent academic research and potential solutions at the national and individual level. Europeans travel around 6.4 trillion km per year, which is roughly 160 million times around the planet Earth, or about 150 astronomical units, which are 75 round trips to the sun. All this travelling around has a cost, not only in CO2 emissions that drive climate change, but also local costs in terms of air pollution. The most serious air pollutants in Europe are particle matter and ground-level ozone. A recent report by the European Environmental Agency shows that nearly all Europeans that live in cities are still exposed to levels of air pollution that are above the thresholds recommended by the WHO. 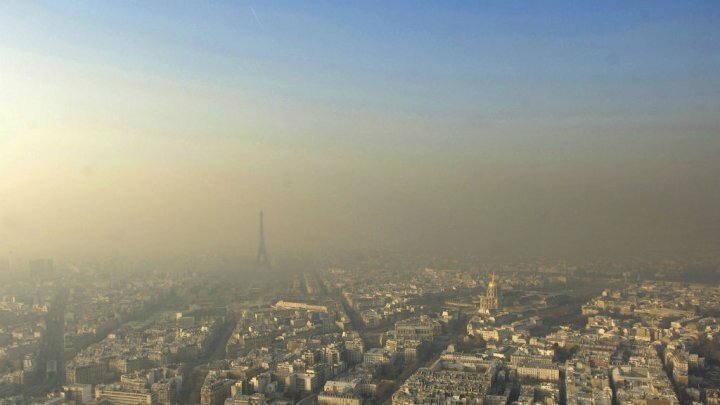 Furthermore, between 2000 and 2012, the population of Europeans exposed to levels of air pollution that were above regulatory thresholds has roughly stayed constant. We are also becoming more and more aware that the initial pollution thresholds that we thought were safe are not, suggesting that even those countries with air pollutions below the threshold may still subject their inhabitants to harmful levels of pollution. I still recall when I lived in the centre of London in 2003. Every evening there was a sticky substance on all the surfaces of furniture, and it only took a day after cleaning until one felt the stickiness again. If one blew the nose, then this would show up black on the tissue paper. One can very well imagine that this is not the healthiest place to live. Currently I spend several days a week in the centre of Paris. On days when there is no wind and the clouds are pushing down on Paris, my lungs hurt after a day or two. I can only try to fathom what it means to live in those cities for one’s life. On the city air pollution website of the European Environmental Agency one can get current and historical data on air pollution levels in major European cities. French cities tend to do badly, with Paris being consistently at the top end of the list. London seems to be doing better in terms of air quality, especially after London’s congestion charge, investments in better vehicle technology (e.g. diesel particle filter) and a more modern bus-fleet. But still, air pollution levels in London are so poor that the city started to spray `pollution glue’ in the most polluted streets, which should theoretically trap air pollutions. However, just like geo-engineering, one should be very careful with methods that only address the symptoms but do not address the actual cause. Polish cities like Krakow or Zakopane, have among the highest levels of pollution. While this tends to be bad news for city dwellers, there is another dimension that gets talked about less: inequality. Poorer city dwellers tend to leave in more highly polluted areas, and thus the additional health impacts will induce additional costs on them. Thus, while the rich are able to reduce their exposure to air pollution by e.g. living in suburbs, it is clear that the poor do not have this flexibility. On this topic, Agustin Perez-Barahona and his co-authors were among the first to show that the health impact from environmental quality may lead to poorer countries being trapped in a low-income, low-health situation, whereas sufficiently rich countries may be able to grow to a high-health, high income equilibrium. This is bad news for the poor. This brings us to international statistics, and there European countries are not doing that badly. For example, France, Germany, UK, Italy or Spain, they are all on the lower spectrum of deaths from air pollution. In comparison, developing countries like China or India tend to have triple or four times as many deaths from air pollution per 100,000 inhabitants. Half of these additional deaths in countries like China or India tend to come from indoor air pollution, which does not pose a problem in European countries any longer. Indoor cooking or heating via wood or coal are the culprits, and it seems reasonable to assume that only a sufficiently high income will allow the inhabitants in those countries to purchase healthier alternatives like electronic stoves or heating. Thus, economic growth may just be the only solution in sight to reduce deaths from indoor air pollution. In comparison, outdoor air pollution (see Figure below) seems to follow a kind of Environmental Kuznets Curve (EKC), which means that deaths from outdoor air pollution increase with increasing income, but then reduce again for higher levels of income. Though the graph is only based on the sample of the G-20, there is evidence for the existence of an EKC throughout the world, for various pollutants, in cross-sections of countries and also over time. A very good review article is the one by Stern (2014) : The Environmental Kuznets Curve: A Primer. This EKC however means one unfortunate news for outdoor air pollution in poor developing countries that are on their transition paths to becoming rich: It will get worse before it gets better. What can be done about this? Here are some points that a policy maker may want to take into account. City planning; if your country is developing, then there will be a transition to urbanization. These urbanized centres tend to be the places where outdoor air pollution is the worst and policy makers have the opportunity, with good planning, to help develop cities into low pollution cities. I guess that this is one of the most important and cheapest solutions for addressing air pollution: For example, it is extremely costly, if not impossible, to improve or reshape the roads in Paris or London. However, a developing country that is on its way to be urbanized will see growing cities that can be designed in such a way as to have an effective transportation system where inhabitants do not need to drive their car to work but can rely on more efficient public transportation systems. Reducing urban sprawl; while this belongs to a good city planning, it deserves a separate bullet point. 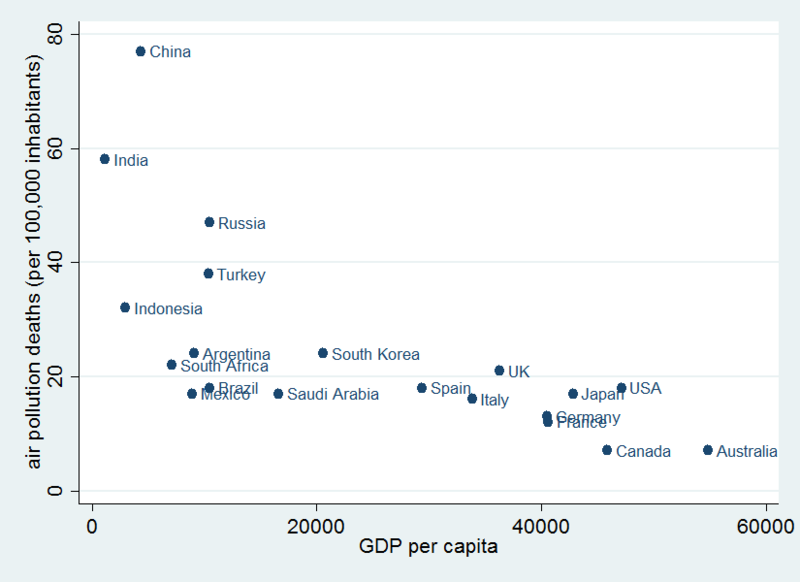 For example, in China in 1978, the per capita urban living space was 6.7m2, while in 2003 it was already 23.6m2. In France it is roughly 40m2, while in the US it is 67m2. Thus, not only is our population increasing, but each person, as he or she gets richer, also demands more space. The houses that we are nowadays living in with two or three people were, only 80 years ago, inhabitated by more than 10 people. Also, when people get richer, they want to move out of appartments and get their own houses. In terms of environmental impact, these houses are obviously much worse than appartments. Also, the urban sprawl leads to more commuting, which is costly in terms of air pollution and obviously time. If the objective is to reduce urban sprawl, then this must be done in the earliest stages of economic development, since at later stages it is nearly impossible to introduce policies that reverse this problem. Technology adaptation and transfer; there is no reason for which poorer countries in transition need to re-do the same mistakes as those that have been done during e.g. 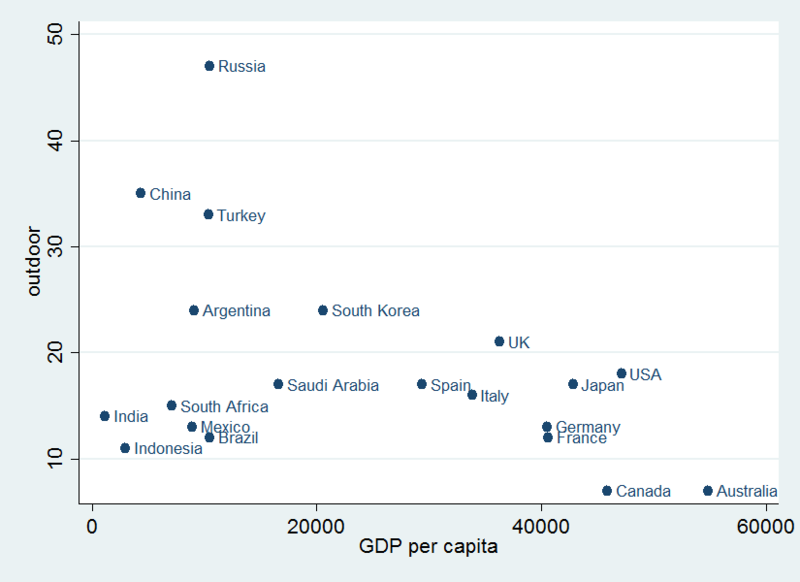 the industrial revolution of the currently rich countries. Developing countries should not need to re-invent dirtier technology but should be able to benefit from the highly developed, cleaner technology of the developed countries. This kind of technology transfer tends to be opposed by the industry that developed this technology because they fear competition. Nevertheless, there should clearly be solutions, like technology transfers of second-best technology which is not in competition with the currently best technology on the market; one could also imagine a kind of technology transfer where the developing will not be allowed to export those products that are then based on these technologies and thus the industry from the developed countries does not need to fear international competition. As a result, the EKC may end up being much flatter, and deaths from air pollution during the growth transition may be much lower. Grassroot movements; “Fifty-six percent of journeys we make in Britain are less than 5 miles,” UK Green Party Leader Bennett said in an interview. This goes hand-in-hand with a percentage of overweight or obese that is now at a staggering 65%. A double-divident policy would be to make those 56% of all journeys on foot or bicycle, which at the same time saves on unhealthy car emissions and reduces unhealty overweight. It is obviously difficult to introduce regulations or policies that shift those short journeys from car to foot. Hence, information policy, advertisements, health advice and alike may be the only solution for a goverment to help shape out grassroot movements, or action at the individual level. However, a good city planning may be of help again, too. For example, introducing sufficient bicycle paths or pavements, giving priority to those on foot or bicycle, may help support an individual’s decision to leave one’s car at home.